Old Guard Gaming : I have nothing ready today. So, I'll distract you with Conan Art! Edged weapons only do half damage! Dumbass. Here's a very atmospheric sketch by Mike Mignola. I think that, as he did on the Fafhrd and Gray Mouser book jacket, he does an excellent job of conveying mood by grouping elements and themes of the story into a collage-like image. As a book cover, I don't think you could do alot better than this. 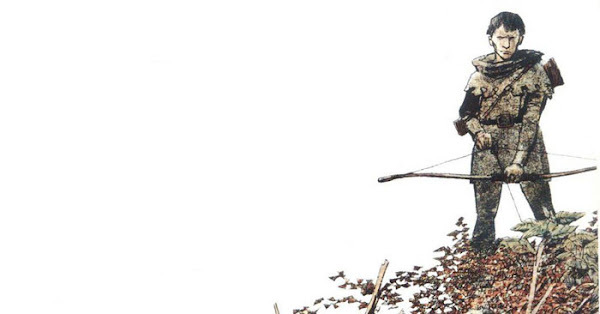 The job of cover art is to grab your attention and hint, or more, at the nature of the tales told within the book covers. 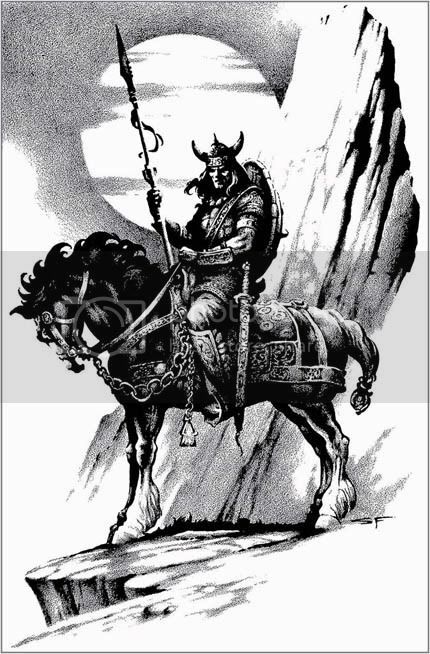 This image really says Sword&Sorcery to me. The only thing missing is a scantily clad dancing girl. I really like this one too. 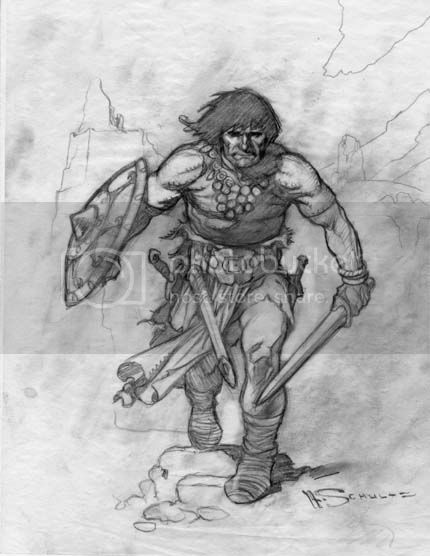 This is a sketch by Mark Schultz, best known for his Cadillacs & Dinosaurs, and Xenozoic Tales. Which you should also check out, as it's a gold mine of inspiration for a weird science/sword&planet type campaign. Just look at the grim expression Schultz gives Conan with pencil shading. In fact, just look at all of the dynamic motion and sense of iron resolution the image projects. That Cimmerian is coming to kill you. Gil Kane, a classic from 1974. Very clean and sharp. I think Kane did some of the John Carter, Warlord of Mars series that Marvel printed. I might be mis-remembering that though. Do any of you guys know? Stephen Fabian, a scene from The Tower of the Elephant. 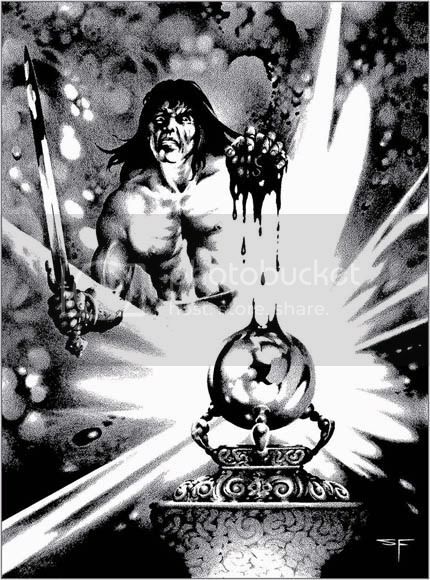 Conan is squeezing the heart of Yag-kosha to drench the jewel in blood. Fabian did some D&D art here and there, I think mostly in the 2E era. Though, I do remember pieces of his appearing in Dragon. Man, do I miss that magazine. I mean, it was pretty much useless to me after 3E, but still. 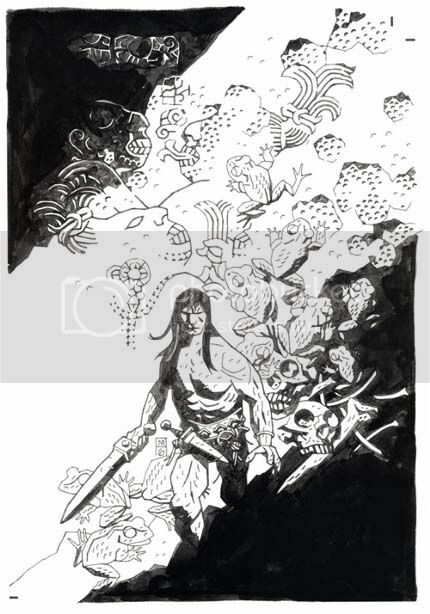 Another Stephen Fabian piece, and one of my favorites of his, and of Conan. Here is Conan completely equipped, as R.E. Howard would have him. At least, at the beginnings of stories, before his mail was shredded, and he lost his helmet and shield saving that hot dancing girl. When I envision a barbaric fighter PC, it's alot like this. 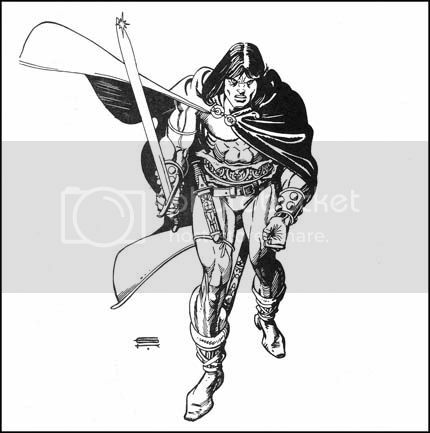 I know the fur loincloth has alot of cultural traction in the main stream Conan fandom, but I always prefer a properly kitted out Conan in art. I bought two issues of the Gil Kane "John Carter of Mars" recently, so you remembered right. Great art, although the issues I got have hardly any Dejah Thoris in them. Come on!